I love this recipe not only because of how wonderful it taste, but it is also crazy simple to make! As far as I am concerned coffee and chocolate are a natural together, and the addition of the toasted almonds to top this dessert really provides extra crunch and flavor. Even my hubby loves this dessert and he is about as far as you can get from being a coffee drinker. I am pretty much always guaranteed a "wow" from my lunch and dinner guest whenever it is brought to the table! 8 oz. tub of Cool Whip minus 2 T.
Blend the softened cream cheese with the syrup and sugar using a hand mixer. Then gently fold in the Cool Whip by hand. Remember to keep 2 full tablespoons of Cool Whip to the side to use for topping. Place half of the cake in the bottom of a trifle dish or large bowl. Drizzle 1/2 of the coffee over top of the cake. Then add half of the Cool Whip mixture and then repeat the layer one more time. Add the dollop of whipped topping to the top and sprinkle a dusting of the cocoa powder and top with the toasted almonds. Refrigerate before serving and enjoy because this is a real crowd pleaser. looks oh so yummy! thanks for sharing! found you on the shabby creek! : ) going to go become your newest follower right now! : ) take care and ENJOY the evening! see you soon! Thank you for stopping by earlier Andrea. I tried to post a comment to your site but wasn't able to for some reason. Your blog looks lovely...I am a big fan of anything vintage. 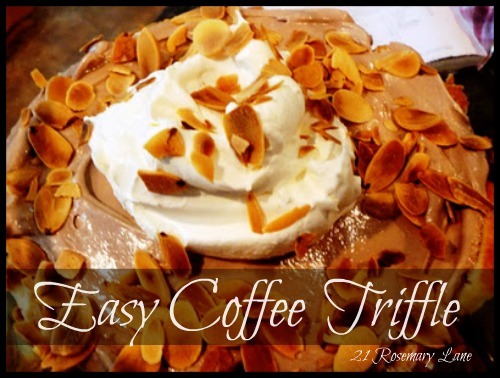 Love trifles and then add coffee and well that is perfect. Oh, I must make this. I love trifle. Thanks for sharing this recipe. That looks sooooo good. Thanks for the recipe. I love to make trifles, and this one looks delicious! And it has my favorite ingredient-coffee! I love trifles. Trifles with coffee. And whipped cream. And chocolate. Okay, so now I need to take a trip to the grocery store. Can a trifle be an after-school snack? Oh my, this looks wonderful!! I've never seen a trifle with coffee before. I think I'm going to have to make this! Beautiful blog you have--this is my first visit. You had me at coffee! I wonder if it is too late to make some? Gonna have to give this a try! Thank you so much for linking up with the frog!! Sounds as yummy as it looks! Your recipe looks divine! I love trifles and the addition of coffee, a real plus! Thank you for sharing your recipe at Potpourri Friday! Barbara, this is gorgeous! I love trifles and will have to add this to my recipe box. Thanks so much for linking up today.